The California Harvest has begun! The Napa Valley Register states the wineries feel this will be an excellent vintage. White grapes have already been picked and red grapes should be ready very soon. The article discusses 11 AVAs (American Viticulture Areas) and gets the opinion of several wineries about the harvest. The SF Chronicle states the harvest is probably going to occur about two weeks earlier than usual with slightly lower crop yields. But the weather conditions continue to be excellent which should bode well for the grapes. The article also mentions the harvest conditions in several different counties. Wine Business also states this should be an excellent vintage. What this may indicate is that the 2007 California wines could be exceptional. That could also mean that prices for the 2007 wines could be high. Poll #7 has now ended and the poll question was: If You Dine Out, What Type of Entree Do You Usually Order? First place goes to Poultry, with 4 Votes. Second place was a three-way tie, with 2 votes each, between Steak, Seafood and Lamb. And poor Pork received no votes. So, onto Poll #8. Let us return to a wine topic. So, the question is: How Often Do You Drink Wine? September begins tomorrow and ushers in a month full of special wine and food events. So, check your calendars and mark down those events that appeal to you. You can see a full list at the bottom of this page and I will highlight some of them here. The North Shore Winers will be attending the following events. Join up with us and come to these special tastings. There are a couple of Food Events I want to mention as well. Sept.23: Phantom Gourmet Fall Food Festival. From 11am-4pm. Over fifty food vendors plus entrance to several parties. Tickets $40. Lansdowne & Ipswich Streets, Boston. Near Fenway Park. A few weeks ago I posted about The Cheesecake Factory in Peabody buying a liquor license for $135,000 because all of the licenses were sold out in Peabody. Today’s Boston Globe has an article about Woburn’s efforts to increase the number of liquor licenses it possesses. The article also discusses liquor license issues and statistics in other towns and cities. One interesting tidbit is that the Trade Center 128, currently under construction, has potential plans to open a high-end steak house. No real details are given. Will this be one of the chains? And how will it fare against the Capital Grille in Burlington? Woburn only has 40 all-alcohol liquor licenses and may seek an additional 10, though only to use for restaurants. What are their chances? Well, about eight towns and cities annually receive additional licenses. Though the article does not state how many actually petition for additional licenses. Curiously enough, Woburn only has all-alcohol licenses. They are not authorized for wine and beer only licenses. Medford and Burlington are also seeking additional licenses. Arlington can only have a limited number of all-alcohol licenses but unlimited wine and beer licenses. What is fascinating is a partial list of cities and towns and their issues and available licenses. It certainly indicates areas where restaurants would have an easier time obtaining a liquor licenses, and not having to expend $100,000 or more for such. Stoneham is listed and they have issued 16 all alcohol licenses and 0 wine & beer licenses. But they have available 7 all-alcohol and 5 wine & beer licenses. So, Stoneham could accommodate some additional restaurants. Reading also has a significant number of licenses available. Winchester on the other hand has also a few available. Towns such as Wakefield and Melrose are not listed in the article. For many restaurants, a significant portion of their profits comes from alcohol sales so these licenses are very important to them. Tonight my wine was Kosher. I recently discussed the wines of Israel and then found one of their wines at the Grapevine Travelers in Medford. I bought the 2002 Noah Tevel Merlot ($23) which is imported by Abarbanel Wine Co. The Noah/Hevron Heights Winery is located in the Judean Hills in Qiryat Arba. All of their wines are Kosher. Noah is considered the first vintner in recorded history. “Tevel” is Hebrew for “Nature” or “The Natural World.” In honor of Noah and the animals in the Ark, Noah Tevel wines feature scenes from the animal kingdom. The Merlot has the picture of a tiger on the label. The Merlot, as are all Tevel Reds, spent 12 months in oak. All Tevel wines are also Mevushal, O-U certified and carry two additional Israeli certifications. What does it mean for the wines to be Kosher? Well, the wines have been created for sacramental use for the Sabbath, holidays and special occasions such as weddings and brises. Kosher wine is a process. "These are the world's oldest wine-making laws stipulating production wholly by the rabbis and their assistants to ensure that the only thing in a bottle of kosher wine are the grapes themselves. There are no animal or food additives of any kind. No sugar or fruit juices added. Kosher wines are not "blessed," rather, they are made kosher so that blessings can be offered on them. Special kosher yeasts and enzymes are used for fermentation and when called for, wines undergo heat flash pasteurization to make them "Mevushal." More information can be found here. So, what did I think of this wine? It has a fruity nose and a dark purple color. It has nice fruit flavors on the front palate, some plum and black cherry. But it does finish a bit bitter and tannic so would be better with food. I did drink it with some fried Pierogies, sauteed in butter, oil and garlic. The bitter finish did smooth out some though it would have probably been better with beef or game. This was an ok wine though nothing special. At its price, I think it was a bit expensive for what you get. So, I would have to call this a Drink but Not Buy. I recently posted about the wine industry in China and am following up on that post with another about a Chinese winery that makes ice wine! Tonhwa Grape Wine Co., Ltd., established in 1937, is the first Ice Wine producer in China. It is also the winery at the highest latitude in China. The People's Daily Online reported that Tonhwa recently purchased a large stake in the King's Court Estate Winery in Ontario. This will help expand their Ice Wine capability. No info on whether their Chinese Ice Wine is exported to the U.S. but I will keep looking. My next column of "A Passionate Foodie" can be found in the August 29 issue of the Stoneham Sun newspaper as well as The Reading Advocate. Both are weekly free newspapers. I write a weekly column that concentrates on reviews of local restaurants though it may also touch on a few other food and wine topics. This new column was published today and is available online as well. This column is a restaurant review of Savory Tastes Cafe in Reading, one of my favorite restaurant. You can also read an extended review of their recent Clambake dinner online. If you have any questions or comments about my column, feel free to add them here. Next week, my column will recommend some local wine stores. I stopped by Georgie D's Place this evening for a quick dinner. Overall, it was another excellent meal. Though I noticed a couple subtle changes in a couple of the dishes. We began with the Farmer's Sausage appetizer, something I have had there before. The gorgonzola cheese sauce was a bit thinner than previously, a slight change made by the Chef. The sauce was still quite delicious. The taste was really no different, it was simply not as heavy. I then ordered the Chicken Marsala. The ham was different than before. Rather than small cubes of ham, this was more pieces of Prosciutto slices that might have been sauteed. This was a very nice change. It enhanced the dish and was a pleasant surprise. We also ordered one of the specials, a haddock with a brandy brown butter shrimp sauce. This was a large, tender piece of haddock with a very tasty sauce. It seems that the Chef is doing a little experimentation, trying to make his dishes even better. It certainly seems to be working so far. If you love Spanish food and wine, what should you do? How about travel to Spain, to get the food and wine at its source? That is exactly what I will be doing. In exactly one month, I will be traveling to Spain for a two-week vacation. This is a trip that I have been planning for about a year. I spent time researching, seeking the best trip that would cater to my food and wine desires. I needed to decide which regions of Spain to visit, what places I wished to see. I checked out several tour companies and one company stood out, Cellar Tours. Cellar Tours offers luxury food and wine tours of Spain, Portugal and Italy. I read some very positive press about the company. For example, Forbes Travelers magazine recently listed its Ten Best Wine Vacations In The World and Cellar Tours ran three of the listed vacations. Cellar Tours had several sample itineraries for their Spanish tours and they certainly intrigued me. Plus, they were fully customizable. Cellar Tours would work to develop a personalized tour for you, to cater to your own preferences. What impressed me most initially about Cellar Tours was their professionalism. They were quick to respond to all of my inquiries. They were always courteous and helpful. They made many suggestions and helped me devise a two-week trip that suited what I desired. I had initially inquired at a couple other companies but none of the others were as professional as Cellar Tours. One company was very lax in responding to my inquiries. So, Cellar Tours became my choice. Now, I have been dealing with Cellar Tours for many months and that professionalism has never dimmed. I could not have asked more of any tour company. This has made me confident that my vacation will be exceptional. I will visit several regions of Spain, starting in the city of Madrid and ending in Barcelona. I will visit about nine different wineries, in areas such as Rioja, Priorat and Penedes. I will dine at exceptional restaurants, including at least one Michelin three star in San Sebastian. I will visit the Boqueria market in Barcelona, dine on tapas, attend La Perla spa, and so much more. Though there is much planned, I will have plenty of free time as well to explore Spain. The vacation will not be inexpensive. But it is a luxury vacation and you get what you pay for, a dream vacation. It includes high end hotels and restaurants. It includes a personal driver and guide when traveling to the various wineries. There are many other extras as well. While I am away, I will take many photos and notes. My adventures will eventually end up here in my blog. I will review the wineries I visit, the wines I drink, the restaurants where I dine. You will feel like you have been in Spain too. I hope you will enjoy. Thanks to Peter May of The Pinotage Club for allowing me to post the above picture. 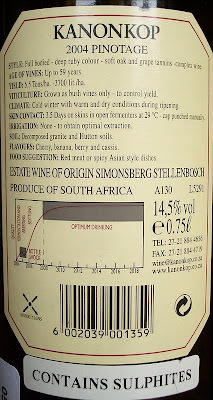 This is a photo of the back of the bottle of 2004 Kanonkop Estate Wine Pinotage in South Africa. If you look at my previous post on this wine, you can see a photo of the back of the bottle sold in the U.S. In comparing the two, you will note that the maturation graph is not included on the U.S. bottle. Such a graph can be helpful in understanding which wines would benefit from cellaring, and how long they can be optimally stored. I know I still have difficulty determining the optimal times for storage of wines. I think such graphs could be beneficial on a number of wines. Peter May did raise a good point though that such graphs could also turn off some buyers who won't want to wait to drink their wines. I have long been a fan of the Pinotage varietal and consider it one of South Africa's great grapes. Yet it is a varietal that many people either love or hate. I think it gets a bad rap though and more people would like it if they had some of the better Pinotage wines that exist. I recently purchased a few bottles of the 2004 Kanonkop Estate Wine Pinotage ($35). I have heard much about this wine, very positive press. But I was a bit concerned over whether I should drink it now, or let it sit in my cellar for some years. I had read an article over at The Pinotage Club discussing how many of Kanonkop Pinotages needed to age for ten years. So, I emailed Peter May at The Pinotage Club to ask him about the matter. Not only did he quickly respond to me, in a lengthy email, but he even tasted the wine again and wrote about his thoughts. His praise for the wine only made me even more eager to taste it. The 2004 Kanonkop Estate Wine Pinotage is 100% Pinotage, made from vines that are up to 59 years old. The wine spends 16 months in new French oak and it has a 14.5% alcohol content. It is made in the Simonsberg area of Stellenbosch. The wine is inky dark with a fruity nose, a smell of ripe berries. On the front palate, there were nice cherry and blackberry flavors that soon merged into a more smoky, bacon flavored finish. That merging was seamless, and the flavors just seemed to naturally change on the palate. It was a very smooth wine, with mild tannins. A lush mouth feel that definitely pleased me. And the more I drank, the more complex it seemed. Tinges of other flavors seemed to peek out, even a bit of chocolate. This wine certainly did not need to age to be an excellent wine. Some Pinotages have a more earthy taste, which I don't mind but which turns others off. Yet I did not really find much earthiness here. This is the type of Pinotage that any wine lover should enjoy. It is just a superb wine, with a balanced complexity and luscious taste. I paired the Pinotage with pasta and sausage. Yet it was a home-made venison sausage, very spicy, plus it was in a spicy Arrabiata sauce. With the taste of wild game, and the spiciness of the sauce and sausage, I thought this might be a good pairing. And it definitely worked. The Pinotage flavors melded perfectly with the food. Overall, this was an excellent wine and a strong Drink & Buy recommendation. If you want some of the best of Pinotage, this is your wine. If you don't think you like Pinotage, then I challenge you to taste this wine and see what you think. I still have a couple bottles left, and will let them age a bit. Though I am going to seek out some more of this wine so I can drink some now as well. Peter May was certainly right about this wine! This weekend we had a large family BBQ, with family on both sides. Though it was a very hot and humid day, we still had lots of fun, and ate much great food. The star of the day was the Rappie Pie, an old tradition in my in-laws family. Rappie Pie is a traditional Acadian dish. Though its origins are murky, it may have made its appearance in Nova Scotia around 1755 when the Acadians were deported. There are a few legends that it may actually extend back to the 1500s. It has remained popular, especially by the Acadians of Southwest Nova Scotia. Rappie pie is a made from grated potatoes or in French, "patates râpées." The French word râper means "to grate." Thus, that became transformed into "rappie" pie. Once the potatoes are grated, most of the water is removed. This used to be done by squeezing the potatoes in a cheese cloth, a laborious process. Then, broth is added along with meat, onions and pork fat to make a casserole type dish. There are a number of variations on this basic recipe, some people using different types of meats or even seafood like clams. People generally put butter or molasses on their Rappie Pie. There is an old adage that the English use butter and the French molasses. Some people may put other items atop their Rappie Pie, even ketchup, but that is much less common. It used to take all day to make Rappie Pie, especially trying to squeeze the water out of the potatoes. Nowadays, you can buy frozen packets of potatoes where the water has already been removed. This makes it much quicker to make. My in-laws make Rappie Pie a few times each year, usually making it into a large family gathering, helping to promote closeness in the extended family. Nearly everyone loves Rappie Pie and the next generation is learning how to make it. It is definitely not a tradition that will die out. I love Rappie Pie, slathered in butter. Sometimes people don't like its color, the grayness of the interior, but once they taste it, they change their mind. And besides its deliciousness, the sense of family behind the gatherings is also great. Such a nice tradition. We will have another big gathering in the winter and I am looking forward to it. Wine is made in many countries and some of them receive very little press in the U.S. It can be very difficult to find wines from certain countries in local wine stores. Yesterday, I mentioned a news article about the wine industry in China. Today, I found a new article, at Wine Review Online and written by Ed McCarthy, concerning the wine industry in Israel. Wine making in Israel extends back about 5,000 years. But the Moslem conquest devastated the wine industry in Israel, destroying all of their indigenous grapes. So today, Istael relies on international varietals, especially French ones. The article discusses some of the current and best wineries in Israel. The most common varietals are Cabernet Sauvignon, Merlot, Chardonnay and Sauvignon Blanc. Mr. McCarthy then provides tasting notes for ten wines from three different wineries in Israel. And all of these wines are available in the U.S. Check out the article, and see if you can find some new Israeli wines. Curiously enough, I read a forum post over on Catavino giving a review of a wine from China and then came upon a lengthy article, in Wine Business.com, discussing the current state of the wine industry in China. This is a very interesting article. An International Conference on the Wine Market in China was held August 8-11, in Beijing. There are now 500 wineries in China, though only 17% of their wine is exported. There is even a map showing the five largest wine producing areas in China. The Chinese government is wine friendly and has encouraged people to drink more wine for its reputed health benefits. Wine sales in China have grown by more than 68% from 2001 to 2006. There is a significant problem though as there is a lack of regulations regarding wine production. For example, wine producers may not place the correct vintage on their bottles. They might instead place a vintage date considered lucky, especially using the number 8 which is considered very lucky. As another example, they might sometimes use grapes from other countries in their wines. Though the bottle won't mention that fact. China also does not yet have an appellation system. China does have many native grape varietals, though not all have been translated into English. The article also gives tasting notes of seven Chinese wines which were considered especially good. So, check out the full article. I stopped in a small, hole-in-the-wall Thai restaurant for lunch called Bangkok Spice. Located on Haven Street in Reading, I have heard some very good things about it so I figured to give it a try. The restaurant has only about 7-8 tables. While I read over the lunch menu, I was brought a small bowl of soup. I guess the soup comes with all of the lunch dishes. The soup had some thin noodles, a couple tiny pieces of chicken, and a few scallions. The clear broth was very tasty, with a bit of sweetness. The noodles and chicken were good too. I don't know what name of the soup but it was delicious. The lunch menu includes a few appetizers, noodle/rice dishes, curry dishes and combination plates. Plates range from $5.95-$7.95, so prices are reasonable. With the curry and combo plates, you get to choose between chicken, duck, beef, pork, shrimp, scallops, squid and tofu vegetarian. I chose the Massaman Curry dish with chicken ($7.25). This is usually the first dish I order at a new Thai restaurant, as it gives me a good standard upon which to judge the restaurant. This Massaman dish was a bit different as it came with additional veggies, including green peppers and zucchini. But my server told me it would be no problem to omit those veggies that I did not like. This indicates that dishes are made to order which is a good thing. When the Curry arrived, it was a good-sized plate with plenty of chicken, some big chunks of potato, a mound of rice, and some veggies. There was even a small Thai roll on the side of the plate. A nice addition. The Curry sauce was mild with a good coconut taste. I was pleased with the food. I did notice that the other lunches that people were eating were fairly large plates too. At the price, this is a good value lunch stop. The dinner menu has more options and the prices remain reasonable. The dinner Massaman Curry with Chicken is only $8.95. I will return again to try more of the menu. For now, I do think it makes for a good lunch. I previously reviewed the NV Castellar Cava Rose ($9.99), when I was also able to meet the winemaker, Emili Esteve Punti. I very much enjoyed this wine so opened a bottle last night with my wine buddies. They all enjoyed it, surprised at the wine. Some are not that keen on Sparkling Wines or Roses. But this was a big hit. For the price, this is an excellent bargain and an alternative to the same, old Champagnes. Polls #5 & #6 have now ended. The Poll #5 question was: Would you rather have a California Cabernet Sauvignon or a French Bordeaux? This was a close vote, with California inching out France in a 6 to 5 vote. Would California win the other Poll as well? The Poll #6 question was: Would you rather have a California Pinot Noir or a French Burgundy? This time France seized a commanding victory against California in an 8 to 3 vote. There are curious results, a division of New and Old World. For Cabernet, people preferred a New World style, a fruitier, bolder, higher alcohol wine. Yet for Pinot, people preferred the more subtle Old World style. For our next poll, let us return to Food. Poll #7: If you dine out, what type of entree do you usually order? Steak, seafood, poultry? Would you like to meet other fellow wine enthusiast and attend local wine events? If so, then maybe you should check out The North Shore Winers. Over six months ago, I created the The North Shore Winers, to bring together people who love wine at fun wine events. We currently have over 130 members. As the organizer, I select or create various wine events for the members of The North Shore Winers to attend. These include wine tastings, wine dinners, winery visits, educational seminars, and more. Most of the events occur north of Boston. We have attended wine tastings in Reading, Winchester, Medford, North Andover, Woburn and Saugus. We have visited the Red Oak Winery in Middleton and the Turtle Creek Winery in Lincoln. We had a private wine dinner, a Spanish Tapas dinner, at Savory Tastes Café in Reading. We have had two Wine Education Classes in Saugus. A few of our upcoming events include: Free Wine Tasting of Unusual Grapes on September 15 in Waltham; Free Fall Wine Tasting of over 50 wines on September 20 in Woburn; and a Free Grand Wine Tasting of over 50 wines on September 29 in Saugus. Membership is free and open to everyone. All you need to do is sign up for the group on Meetup and then RSVP for future events. So come and join us! Have fun, drink wine and meet some interesting people! If you have any questions, feel free to ask me. Just a reminder, as the deadline approaches. Would you like to turn an empty wine bottle into $1. You can do so for about another week, until August 30. The Vineyard wine store will take your empty wine bottles and give you $1 in merchandise credit for each bottle. You can bring as many as 120 bottles per day. You can then spend your credits up through September 15. Sounds like a pretty good deal to me and I have a couple cases of empty wine bottles ready to turn in. If you do this, you will be helping the environment. The Vineyard will recycle the bottles or find an appropriate "re-use" for the bottles. This is an excellent recycling program where everyone involved will benefit. The other day I stopped for lunch at Zaleks in Wakefield. Located just off Main Street, on Princess Street, it is basically a roast beef/seafood joint. But it may be one of the most ambitious such joints I have ever seen. It is a very casual place. You can sit at one of the tables inside or outside. You might only be able to fit about twenty people at the tables inside. You order at the counter and pick up your order when it is ready. I do not know if they have waitress service at night or not. One look at their menu though indicates their ambition. You start with roast beef sandwiches, burgers, rolls, wraps and other sandwiches. There are also fried seafood dinners, salads, sandwich dinners and the usual side orders. They also have grilled thin crust pizza, steak tip dinners, and house specialities. More unusual for this type of restaurant, they also have char-grilled fish dinner as well as USDA Prime steaks! You could order a 16 oz. NY Sirloin Strip for $17.95 or a 10 0z. Filet for $18.95. Or maybe Swordfish ($14.95), Ahi-Tuna ($11.95), or Salmon ($10.95). With the size of their menu, you might have difficulty deciding what to order. I had one of the House Specialties, the Monte Christo ($5.75). The Monte Cristo has long been one of my favorite sandwiches, though few restaurants carry it. At Zaleks, it is ham, turkey, and swiss cheese on Challah bread, dipped in egg batter and grilled. It is like a sandwich on French Toast. The sandwich comes with French Fries. The sandwich was certainly very full of meat and cheese. It was a good sandwich, and something I would order again. The Fries were ok. They were shoe string Fries which are far from my favorites. They were cooked fine, not overdone. I just prefer different types of Fries. I think this sandwich was worth the price. I do plan on returning to Zaleks to try more of their food. I will travel to Spain at the end of next month, with plans to visit numerous wineries and fine local restaurants. In the near future, I will visit Italy, with the same intentions, to seek out fine wine and food. When I do visit Italy, the book I have just read may be of special benefit. I do wish there had been a similar book for Spain as well. 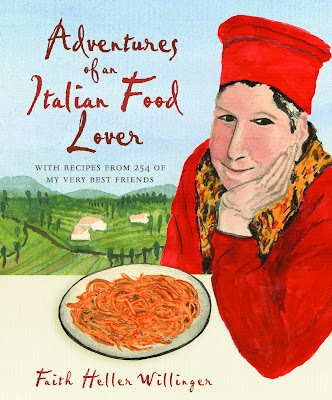 Adventures of an Italian Food Lover: With Recipes from 254 of My Very Best Friends ($32.50) by Faith Heller Willinger is published by Clarkson Potter/Publishers, an imprint of the Crown Publishing Group, a division of Random House. Adventures is a hardcover book with 256 pages. It is a combination of travel guide and cookbook, a fascinating mix which is sure to keep your interest. The book is separated into three sections based on the geography of Italy, including Northern & Central Italy, Tuscany, and South Italy & the Islands. Each section contains descriptions of restaurants, wineries, food artisans and much more. After each specific description, there is a recipe derived from that place. There are over 100 recipes in this book. As for the place descriptions, the author has travelled to all of the places she mentions. She fills each description with personal, insider information. You feel as if you are being let in on the secrets of Italy, the best and most interesting places to visit. The descriptions make for a fascinating read. Each description also contains detailed contact information. If you are traveling to Italy, you are sure to find places that you will want to visit. You can read about Mauro Lorenzon, a sommelier skilled with using a saber to lop off the tops of sparkling wine bottles. Or a hotel bar in Venice where Walter Bolzonella creates superb Bellini cocktails. You might learn of Tuscan cheesemakers, Guido and Giulia Pinzani, who make San Gimignano, a saffron-flavored pecorino. Or even Armando Manni, maker of Italy's most expensive extra virgin olive oil. I learned of Bettina Rogosky who makes wines from Caberlot, a hybrid of Cabernet Sauvignon and Merlot. And a brother/sister chocolate makers, Alessio and Cecilia Tessieri who specialize in single-country cru chocolate from Venezuela and other countries. There is so much more to read about, from gelato in Rome to a fish market in Catania. What about the recipes? Generally these recipes range from easy to medium to prepare and most cooks should not have problems preparing most of the recipes. A few of the recipes do call for more specialized ingredients but the book provides information on acquiring such ingredients. The recipe are generally easy to understand. I have found a number of recipes that I would definitely like to try. These include such dishes as the Sweet and Sour Chicken Bites, Fusilli with Chicken Bone Sauce, Chianti "Tuna" Pork, Tuscan Brownies, Smoked Mozzarella Cutlets, and Lucia's Walnut Cake. There are recipes that should appeal to a wide audience, from appetizers to desserts. The author's sister, Suzanne Heller, has illustrated the cookbook with her watercolors. Though these watercolors are very nice, none of them depict any of the recipes in the book. And that is the book's only failing, a lack of pictures or photographs of the recipes. Most readers seem to want at least some pictures/photographs in a cookbook, especially of the more complex recipes. That will keep some from buying this book. I still recommend Adventures though. It is interesting to read, would be excellent for those traveling to Italy, and has some intriguing recipes as well. I certainly would like to see more travel/cookbooks like this for other countries. Disclosure: I received a review copy of this cookbook from Random House. I was not under any obligation to actually review it. And if I did review it, I was under no obligation to say anything specific about this book. Everything was solely at my discretion. My next column of "A Passionate Foodie" can be found in the August 22 issue of the Stoneham Sun newspaper. The Stoneham Sun is a weekly free newspaper. I will be writing a weekly column that will concentrate on reviews of local restaurants. The column may also touch on a few other food and wine topics as well. This new column will be published tomorrow though it is available now online. This column is a restaurant review of the Dairy Dome, which recently expanded their menu to include many items, including some excellent Italian dinners. If you have not been to the Dome lately, go check it out! If you have any questions or comments about my column, feel free to add them here. Next week, my column will be another local restaurant review. The Boston Globe reported that Darden Restaurants Inc. (which owns Red Lobster and the Olive Garden) will purchase Rare Hospitality International Inc. (which owns the Capital Grille). I enjoy the Capital Grille. But will this sale lead to any changes in their restaurants? Will they continue to maintain their high quality? Or will they be forced to change to a lesser restaurant? I will be keeping an eye on the Capital Grille, hoping the quality does not diminish. Skinner, a large auction house, is going to start holding wine auctions in Boston. No other auction houses in Massachusetts currently hold wine auctions. Skinner’s retail partner in this venture is Lower Falls Wine Co. Their first wine auction will be held on September 14, 2007 at 6pm at their offices at 63 Park Plaza, Boston, MA. A catalogue of the lots up for auction should be available online around September 1. There will also be a special Champagne Reception & Pre-Auction Wine Tasting on September 12th from 5:30pm-7:30pm. This will also take place at Skinner's Gallery at 63 Park Plaza. as space is limited, you must RSVP by telephone to 617-350-5400. About 200 lots will be up for auction, including some very rare wines: Over 350 bottles from the private cellar of the former owners of the Maison Robert restaurant; a magnum of 1959 Château Lafite-Rothschild (valued at $6K-$8K); two cases of 2000 Château Lafite-Rothschild (valued about $9K); three bottles of 1996 Coche-Dury Corton-Charlemagne 1996 (valued about $5700); two bottles of 1967 Château d'Yquem 1967 (valued about $2800); and a bottle of 1985 Chateau Leoville-las-Cases (valued at $125-$175). The auction will be open to the public and it could be interesting to view, even if you might not purchase anything. The Panarroz, an inexpensive Spanish wine from the Jumilla region, has long been one of my favorite wines for under $10. It is readily available at many local wine stores and is such an excellent value. I recently posted about the new vintage, 2006, that has just been released. Now I come with even better news. A new version of Panarroz will soon be available. It will be called ‘Llex Obradan’. This version will see some oak and they will only make about 500 cases. And it should still only sell for around $15! I will definitely keep my eye out for this Llex Obradan. If it is comparable to the Panarroz, then it could be an excellent wine. And another great value. How much do you know about Italian red wines? Would you like to learn more? If so, you should have been there yesterday at the Wine Education Class at the OurGlass Wine Co. The topic was Italian Red Wines. The class focused on some unique, exceptional red wines from all over Italy. We took a look at a handful of different regions and tasted the red wines of that region: i.e. Piedmont, Sicily, Tuscany, the Veneto, Puglia, to name a few. This class was another collaboration with OurGlass Wine Co.
Our guest speaker was Steven Chevalier from Ideal Wines. He was a wealth of knowledge about Italy. He is the person who actually sources the vineyards that they choose to import. So he knows the winemakers and vineyards personally. Steven was very personable and I am sure everyone learned a lot about Italian reds. About 14 people attended the class, some from the North Shore Winers. We tasted ten wines, most costing under $20. There was also a platter of various Italian cheeses (including Parmesan, Tallegio and Piave), fresh bread and Soppressata. Brian also prepared a sheet listing all of the wines, with full descriptions, for each of the attendees. This was a nice touch. This is definitely not a Riunite Lambrusco! I did not know what to expect but found it to be a serious wine. It is a single varietal, estate bottled wine and is served chilled. It has a bit of frizzante, a slight carbonated taste, which is refreshing. It has lots of flavor, nice berry tastes. This is a perfect summer wine, something that would go well with pizza. This is not just a simple wine though. Even people that don’t like most wines might find they like this wine. A great value at this price and I highly recommend it. Let us move on to the 2004 Castello La Lecchia Chianti Classico ($17.99) from Tuscany. "Castello La Leccia is the typical Tuscany estate everyone deams about. Situated on an hill near Siena surrounded by vineyards and olive trees, the castle is an old fortress you reach through a long alley of cypresses. It is owned by an enthusiastic young man, Francesco Daddi, able to communicate his passion to everyone who works with him. With the help of Paolo Salvi, the famous enologist, he produces wines of increasing quality. The blend is made of 90% Sangiovese and 10% Canaiola and spends 8 months in French barriques. It’s a perfect example of a grand modern Chianti, one that rivals the most ambitiously scaled wines of the region. With terrific fruit extraction and an ample overlay of oak. La Leccia gives a first impression of considerable power. But after an hour or so of breathing, the soft attractive fruit beneath the tannic cloak begins to emerge." This was an excellent Chianti with nice flavors of cherry and raspberry. It has a nice bit of acidity and layers of complexity. I felt that the wine was a little tight and needed a bit more time to breathe. But that did not conceal the quality of this wine. I very much enjoyed this wine and would rate it at the top of similar Chiantis. I heartily recommend this wine. This was a superb wine, a decadent delight. Though it had not been decanted or allowed to breath, the power of this wine was obvious. It is a very complex wine, with many layers of flavors including some dark berries and a bit of spice. It has a long, lingering finish. This is a wine to carefully savor. And at this price, it is a steal. Similar wines can cost twice as much. This is a wine that will benefit from cellaring and which will last a long time. Go ahead and splurge and buy this wine. This is their introductory Dolcetto. It is more perfumy than other Dolcettos. It is concentrated with licorice and dark cherry flavors and light tannins. The wine sees no oak. It is an easy drinking wine, very pleasing. A good value wine. This is a well structured wine with great fruit flavors and a long, smooth finish. Plenty of complexity and well balanced. A serious wine which is definite to please. This wine would easily last ten years in your cellar. A good buy. This wine sees no oak and is filtered. It has lots of bright cherry flavors and is a little tannic on the finish. An easy drinking wine that is sure to please and a good value at this price. A lot of character for the price. This wine has a nice, fruit nose. That fruit is expressed on the palate as well. Such a delicious taste. It has a medium finish and is very smooth. A great everyday wine and a great value at this price. Enjoy this with pizza or pasta. The 2004 Cantina Sasso Aglianico del Vulture ($11.99) is from the Campania region. “The Aglianico varietal has been cultivated in the Vulture area of the province of Potenza from the most ancient times. Vulture’s woods are dense and the volcanic soil rich and fertile. The Greeks planted the original Aglianico but it is now so firmly entrenched in Italy that it has earned native status. It is endearingly referred to as the “Barolo of the South.” The Aglianico grape sprouts late, thereby avoiding frosts, and matures well in this ideal ground of volcanic origin. This aromatic wine has good fruit flavors, with a tinge of sweetness, and is very smooth. It sees no oak and is a definite crowd pleaser. Another good value wine. Another wine that was not part of the class, but was a generous addition, was the 2005 Mola Aleatico Dell’Elba. It comes in a 500ml bottle and sells for around $35. This is a sweet, dessert wine made from Aleatico grapes. This was an excellent dessert wine. It had a nice sweetness that was not cloying at all. You also could taste the fruit in the wine. I think it might pair well with a chocolate dessert. This is the only wine I disliked in this tasting. Its nose had a sour smell that was out me off to this wine. The wine has plenty of cherry flavors but still that tinge of unpleasant sourness. I have had Nero D’Avola wines before and enjoyed them so it is not just the varietal in this case. Overall, this was another excellent wine class. We tasted many very good wines, including some excellent value wines. We got to taste some very different Italian reds as well. Steven was a great speaker and everyone seemed to enjoy themselves. I bought a case of wine and will buy more of these wines in the future. Check out the wines I recommended. Kudos to OurGlass Wine Co. and Ideal Wines! Yesterday, after attending a class on Italian wines, it was time to go to the special Clambake at Savory Tastes Cafe, cohosted with Harpoon Brewery. Like the prior special dinners hosted at Savory Tastes Cafe, this was also an excellent meal. Except for the fact that I dislike beer. I have never acquired a taste for beer so I won't really comment on the beer pairings. For me, the food alone was reason enough to go to the clambake. We began with the Amuse Bouche, a Grilled Shrimp with Pico de Gallo. This was a tasty shrimp with a bit of spicy sauce. Definitely could have eaten plenty more of the shrimp. The 1st Course was a Baccala Cake with Remoulade Sauce. This is a salt cod cake, with potatoes. It was thick, with a nice crispy exterior and a soft, tasty interior. An excellent dish and Chef Bell stated it would end up on his fall menu. Glad to hear that. Next course was Fish and Corn Chowder. This has been on the menu before and is one of my favorite chowders at the restaurant. The chowder is chock full of fish and roasted corn. It is not an overly creamy chowder so it is a lighter dish. Lots of flavor we had a good-sized bowl. Our salad courses was next, the Salade Fruits de Mer. This consisted of greens topped by Scallops, Countneck Clams, Mussels and Crabmeat. The seafood is obviously fresh and I really enjoyed the smoky Mussels. A nice mix of tastes which pleased everyone at my table. There was a brief Intermezzo, some Lemon Sorbet. It was a bit tart, as expected, and was a good palate cleanser. Our fourth course was the Steamed Lobster, Steamed Clams, Corn on the Cob, Potatoes Bravas & Coleslaw. A nice whole lobster with melted butter. The shells were actually fairly soft so it was easy to get at the sweet meat inside. The steamers were tender and tasty. The corn was sweet and the potatoes spicy. This was a large plate of food. Sure it was a bit messy but they provided plenty of napkins and wet-naps. Finally, dessert was Homemade Bread Pudding. This was a superb dessert, made from croissants. I generally do not like raisins but this was made with yellow raisins which are very different from black ones. They were sweet and complemented the bread pudding. I definitely would like to see this available on this regular menu. I did have a bottle of wine with my dinner, the 2003 Limerick Lane Zinfandel. I have had this wine before and always enjoyed it. It is a small production wine and definitely an artisan wine. Always a good choice. Another excellent dinner at Savory Tastes. And I was told that they will be having another special dinner in September. Stay tuned for details! The Midwest Grill in Inman Square in Cambridge is one of my favorite restaurants. It is a Brazilian rodizio restaurant, an all-you-can eat carnivore's paradise. Skewers of grilled meats, including chicken, sirloin, pork, sausages, lamb and much more, are brought to your table. Your server slices off the meat you desire and keeps bringing new skewers until you can't eat any more. They also have a couple buffet with salad, rice, potatoes and Brazilian sides. The food is absolutely delicious! Service is excellent and it is a good value. Today, while watching the Phantom Gourmet, I was thrilled to hear that a new Midwest Grill will be opening in Saugus! That will make it even more convenient for me to visit. What great news. I don't have any more details at the moment. I don't know where it will be located, but it is possible it could be on Rt.1. There is a lot of construction work being done near where the Diplomat used to be located. When I learn more, I will update you. I just can't wait! Last year I visited Seattle and had an incredible culinary adventure in the Pike Place Market. I wandered around the Market, sampling delicious food from many different vendors. One of the highlights was a stop at Beecher’s Handmade Cheese, an artisan cheese shop, owned and operated by Kurt Beecher Dammeier. You could watch them making cheese, mixing it in a large vat. They also had a superb Macaroni & Cheese, one of the best I have had. So, I was excited to see that Kurt Beecher Dammeier had written his own cookbook which was just recently published. 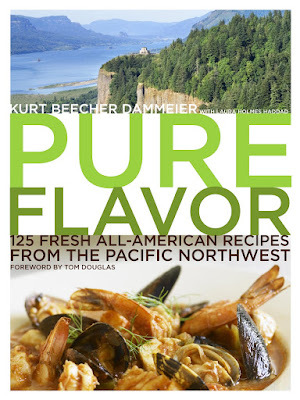 Pure Flavor: 125 Fresh All-American Recipes from the Pacific Northwest ($32.50) by Kurt Beecher Dammeier with Laura Holmes Haddad is published by Clarkson Potter/Publishers, an imprint of the Crown Publishing Group, a division of Random House. Pure Flavor is a hardcover book with 256 pages. As the title indicates, it contains 125 recipes. It is broken down into nine chapters including Soups & Sandwiches, Salads, Pasta & Grains, Fish & Shellfish, Poultry & Meat, Vegetable & Sides, Sweets, Breakfast, and Basics, Sauces & Spreads. The cookbook concentrates on local foods available in the Pacific Northwest region. The idea is that great local ingredients contain "pure flavor" and that recipes should showcase this pure flavor rather than conceal it. So, the recipes are generally simple, using few ingredients. These ingredients are intended only to enhance the flavor of the main ingredient. It is also important to select one's ingredients seasonally, to capitalize on what is fresh. Shopping locally and seasonally for food is certainly a prominent idea in the culinary realm. In Massachusetts, we certainly have the opportunity to do so as we have many local products from which we can choose, from seafood to artisan cheeses, to an abundance of vegetables. So the concept of this cookbook certainly is appropriate. This then raises the issue, is Pure Flavor only of value to those who live in the Pacific Northwest? No, it is not. First, plenty of the recipes use ingredients that can be found all over the country. Or minor substitutions can be made. Second, the cookbook actually provides a list of stores in the Pacific Northwest region, with contact information and websites, from which you can order foods and ingredients you might desire. Third, the cookbook contains more than just recipes. Pure Flavor has numerous sidebar articles on a variety of foods and stores. You will find articles on such matters as Cheese Substitutions, Tomatoes, Crab, Framed vs Wild Fish, Natural Foods and more. There are also articles on local wineries, food markets and artisan food makers. Contact information for all of those is provided. All of these articles are very interesting. What about the recipes? Generally these recipes are simple to prepare and cooks of any experience level should have no problem preparing them. Each recipe is easy to understand and there are plenty of colorful photographs of some of the recipes. One interesting part of many of the recipes is the "Make Ahead" section. This section tells you how long you can make the recipes ahead of time, and how long they will last in the refrigerator. This is certainly a time saver. I have found a number of recipes that I would definitely like to try. They have their recipe for their World's Best Mac & Cheese. The cheese sauce in this recipe is versatile and you can use it in many other dishes as well. There is a recipe for Butter-Steamed Clams. As we often can obtain local clams, this would be an good recipe to make. There is also the Lemon-Harissa Chicken, Lamb Stew, Rustic Blue Cheese Mashed Potatoes, and Apple-Pecan Stuffing. All definitely enticing. For dessert, there is the Giant Snickerdoodle. I love Snickerdoodles so this may be one of the first recipes I try. Though I am torn by the Deep-Dish Cinnamon Buns. There is an excellent photo of these which makes my mouth water. I do recommend Pure Flavor. It is easy to use, has plenty of intriguing recipes, contains some interesting articles and is visually appealing. Whitman Cellars was started by John Edwards and Larry & Sally Thomason in 1998. The name of their winery derives from Marcus and Narcissa Whitman, a brave and idealistic young couple who traveled west to set up a Christian mission amongst the Cayuse people in the 1830s. Narcissa was one of the first women to cross the Rocky Mountains and make it to Walla Walla. The Whitman's unfortunately brought disease with them which killed many Cayuse. The Whitmans were killed and their mission was destroyed. Whitman Cellars makes traditional Bordeaux and Rhone style wines. They currently produce Viognier, Syrah, Cabernet Sauvignon, Merlot, a port, and three proprietary blends called "Narcissa", "Killer Cab", and "Del Rio Red". Fruit is sourced from 19 different vineyard blocks in the Walla Walla and Red Mountain appellations. These appellations offer a wide range of flavor profiles which are used in their blending. They only produce about 5,000 cases a year. The 2002 Whitman Cellars Narcissa Red ($24) is a Bordeaux style blend made of 71% Cabernet Sauvignon, 26% Merlot, and 3% Cabernet Franc. It was aged for 18 months in French, American and Hungarian oak. I first had this wine last year while vacationing in Seattle. I very much enjoyed it and bought some to take home. The Narcissa is very much a Bordeaux style wine. It has a nice, aromatic nose with a tinge of violet. It is a powerful wine though not a fruit bomb in the least. There are some rich dark fruit flavors but also some black pepper and cocoa. It is a smooth wine, with mild tannins, and a lingering finish. There are layers of complexity making this an excellent value for the price. A fine expression of what the state of Washington can do with wine. Boston Restaurant Week ends today, though a few restaurants will continue their special menus for the rest of the month. I went to Icarus this evening, a restaurant I have never denied at before. Located on Appleton Street, just off of Tremont St., it is easy to find and they have valet parking. When you enter the restaurant, there is a small bar at the front and then a dining room, basically split in half by a divider. The room is elegant and very stylishly decorated. Definitely the type of place that would impress a date. They had a limited menu for Restaurant Week, which is in effect until August 26, though. There were about 5-6 choices for appetizer and entree, and 3 for dessert. The menu had many interesting choices. You could also get half glasses of wine with each course for $15 more, or full glasses for $30. The wine selections were pre-chosen for each course. I began with the Corn Chowder, Crispy Bacon and Scallops. This was a very good chowder, with smoky bacon pieces and tender scallops. My wife has the Crisp Polenta, Braised Azuluna Veal Breast, Black Truffles, and Parmesan. This was a supern dish. The veal was very tender, and had a different flavor than the veal I am used to. Azauluna veal is from milk-fed, free range calves, a more humane way. The polenta was moist and crisp and all of the flavors went very well together. I would order this as an entree. A good way to start our dinner. I did not get the wine pairing but instead ordered a glass of the Verdad Rose. I like this wine and it was very good, and chilled properly. My wife did get the wine pairing and had a Benzinger Chardonnay. A bit oaky, my wife still enjoyed the wine. For her entree, my wife ordered the Pan-Fried Sunburst Trout, Pecan Brown Butter, and Bright Lights Chard. Another excellent dish! A large piece of moist fish with a delicious sauce and lots of pecans. This dish came with a Cooper Mountain Pinot Noir which was a fine Pinot, more of a Burgundian wine with nice fruit on the palate. My own entree was disappointing. I had the Roasted Berkshire Pork Loin, Corn Pudding & Watermelon Salad. There were two small slices of pork. It was ok, but nothing you could not get anywhere or even cook at home. The corn pudding was also ok, but nothing special. And the watermelon salad consisted of sweet chunks of watermelon but mixed with peanuts. That is not a good pairing. Very strange. I was hoping for a much more exciting entree. I also had a glass of their red Sangria. It also was just ok. It had a strong alcohol flavor. Service was excellent. Our waiter was courteous, personable and he was not overbearing or pushy. Overall, I enjoyed this restaurant and I would return. I would not order the pork loin again, but would order any of the other dishes we had. Especially the veal. There are many excellent wines coming out of Washington and Oregon. Last year I had the opportunity to visit a number of Washington wineries and I brought home some of their wines. (I will actually be reviewing one of them very soon). In the future I do hope to visit Oregon as well. But, these wines are not as well known as they should be. So, I wanted to bring your attention to a free tasting tommorrow concentrating on these wines. On Saturday, August 18, from 4-7pm, The Spirited Gourmet will be holding a tasting of wines from Washington and Oregon. Poll #4 has now ended and the poll question was: What is your favorite type of California wine? There was a tie for first place, between Cabernet Sauvignon and Pinot Noir, each with five votes. But, Zinfandel, with four votes, was a very close second. And not a single vote for Chardonnay. Red wines certainly dominated that vote. So, onto Poll #5 & #6. Following up on the last poll, let us pit California vs France and see what happens. Poll #5: Would you rather have a California Cabernet Sauvignon or a French Bordeaux? Poll #6: Would you rather have a California Pinot Noir or a French Burgundy? Dining in Boston at restaurants has gotten more expensive lately, at a rate higher than the national average. The Boston Herald had an interesting article today concerning statistics on restaurant costs from the U.S. Bureau of Labor Statistics. The price of dining out has increased 4.5%, up from the 2.9% increase last year. The national average is only 3.6%. The increases are primarily due to higher costs for food and fuel. But what is most interesting is the identity of the restaurants most prone to raising their prices. Who is it? Chain restaurants! Independent restaurants more often absorb the increased costs to keep their prices at a certain level. Obviously they too have to raise prices at a point, but they do tend to be more consumer friendly in such regards. Chain restaurants tend to pass their increased costs directly onto the consumer. I guess that is another reason why many chain restaurants are not good values. That is certainly not true of all chains, but one should be very particular of which chains you frequent. In keeping with the theme of cooking, I received my copy today of the September 30th issue of Wine Spectator. This is their annual Food issue, their third year of such annuals. This issue concentrates on "How To Cook" providing helpful advice on a wide variety of cooking techniques. I have enjoyed their last two food annuals and this issue is no different. If you enjoy cooking, definitely pick up a copy. There are even recipes from some famous chefs such as Daniel Bouloud, Mario Batali and Alice Waters. Are Cookbooks an Endangered Species? I have long been a voracious reader. I love to hold an actual book in my hand. I am not a fan of E-books, online books, as reading them is not the same, having to spend hours staring at a computer screen. I do use the Internet for research but I still buy plenty of books. But what about a specific type of book, the cookbook? Is it an endangered species? The Internet probably contains hundreds of thousands of recipes. For example, All Recipes contains over 40,000 recipes. Examples of other sites containing numerous recipes include Epicurious, Recipe.Com, Recipe Source, and Cooks.Com. You can find recipes for all types of cuisines, using any type of ingredient. So, with all these recipes available, why would anyone want to buy a cookbook? First, it can be difficult sometimes to search for a particular recipe online. It may take a lot of time to find exactly what you want. Thus, it may not be as convenient as just checking a cookbook. The recipe websites seem most useful for experienced users. For a casual searcher, they can be frustrating. A good cookbook can also give you several recipes for the same meal, from appetizer to dessert. Easier to find than searching online for all the different courses. Second, if time is short, cookbooks are probably quicker and easier to use than checking the Internet. Check a cookbook index and find a recipe. Less than a minute. Turn on the computer, let it start up, do a search for a recipe, print it out. Much longer. Third, and what is important to me, is the issue of credibility. Who do you trust to give you a recipe? Some of the online recipe sites are compiled by voluntary submissions. Yet you may not have much information on the background of the contributor. So, how do you know you can trust the recipe? How do you know it will be good? With a cookbook, you usually have much more information on the author/chef. So, you can better judge their credibility. To me, that is an important reason for a cookbook. Fourth, good cookbooks give you more than just recipes. They often discuss cooking techniques, ingredients, suppliers and much more. All this in one book. Online, you might have to go to multiple sites to find all of the same information. Or on one site, you might have to journey to various pages. Other reasons include that cookbooks can be visually stunning and cookbooks can contain recipes that you won't find anywhere else. No, cookbooks are not an endangered species. Or at least they shouldn't be. I'll keep buying cookbooks and hope others do as well. Part of what generated this topic is that I have received a few review copies of some new cookbooks from Random House. If I like any of the cookbooks, I will review them here. I am under no obligation to review them. It is solely up to me. And I will only review them if I think they will benefit my readers. Final Call: Wine Education Class This Saturday! Final call for reservations for the Wine Education class this Saturday, August 18, at 3pm. The topic will be Italian Red Wines. The class will focus on some unique, exceptional red wines from all over Italy. We'll be taking a look at a handful of different regions and showcasing the red wines of that region: i.e. Piedmont, Sicily, Tuscany, the Veneto, Puglia, to name a few. This class is another collaboration with OurGlass Wine Co. Our guest speaker will be Steven Chevalier from Ideal Wines. He is a wealth of knowledge when it comes to Italy and is the one who actually sources the vineyards that they choose to import. So he knows the winemakers and vineyards personally. This is a great opportunity to taste some new and different wines and meet other local wine lovers in the area. The cost is $25 per person, which includes cheese and breads as well as special Tasting discounts. You must call OurGlass TODAY to book your reservation. Here is another wine from a small, largely unknown region of Spain. This wine is from the Emporda-Costa Brava D.O. This region is in Catalunya, next to the French border. The principal grapes here are Macabeo, Garnacha Blanca, Garnacha and Carinena. Roses have been the most popular wine made in this region but new whites and reds are being made now. The winery, Mas Estela, is owned and operated by Diego and Nuria Soto and their two sons. "Mas Estela" translates as “shooting star.” Vineyards have existed on this property for a very long time though were devastated by Phylloxera. In 1989, the Sotos bought the property, very run down at the time, desiring to create a new winery. Their vineyards are now organic and biodynamic. Their grapes include Chardonnay, Black Garnacha, Syrah, Carinena, Monastrell and Muscat d'Alexandria. The 2004 Mas Estela Quindals ($18) is made of 90% Red Garnacha, 5% Syrah and 5% Old-vines Carinena. It spent twelve months in French oak and has an alcohol content of 15%. This is an inky dark-colored wine with a nose of dark berries. On the palate, this is a big, powerful wine. There is plenty of dark fruit flavors, like blackberry and plum. There are strong tannins on the long finish so this is a wine that certainly is better with food, especially a good steak or lamb. I think it is a balanced wine with tinges of almost chocolate. This wine reminds me of a big Cabernet yet the taste is different. It has its own unique flavor. If you like big, bold wines, this is a wine for you. Drink & Buy, a good value! My next column of "A Passionate Foodie" can now be found in the August 15 issue of the Stoneham Sun newspaper. The Stoneham Sun is a weekly free newspaper. I will be writing a weekly column that will concentrate on reviews of local restaurants. The column may also touch on a few other food and wine topics as well. My second column will be published tomorrow though it is available now online. This column is a restaurant review of Georgie D's Place, a new Italian restaurant in Stoneham. StreetInsider has an interesting article on the latest wine consumption statistics for the U.S. for 2006. This information is based on the information from the 2007 edition of the Adams Wine Handbook. U.S. wine consumption in 2006 rose 3.4%, the 13th consecutive year of rising consumption. Domestic wine sales rose 2.6% and imported wines rose 5.7%. It is interesting to see that more people are drinking wine from other countries. Consumers are expanding their horizons which is good to see. So where is this wine coming from? Imports from Italy rose 6.7%, Australia rose 6.8% and France rose 21.9%. Italy is still king as they have 29.3% share of all U.S. imported wines. French wines have seen two years of increase which definitely must please them as they had been seeing decreases for several prior years. This year's increase is certainly very significant. Mmmmm,..where is Spain? The largest imported brands include the Australian Yellow Tail at 8.1 million cases (+7.3%), the Italian Cavit at 3 million cases (+13.2%) and the Chilean Concha y Toro at 2.7 million cases (-2.6%). The largest domestic brand is Franzia Winetaps at 22.8 million cases (-3.2%) and second place goes to Carlo Rossi at 12.7 million cases (+2.6%). Third place belongs to Twin Valley at 8.9 million cases (-5.9%). Champagne and sparkling wines gained 3.8%, the fifth consecutive year of gains, to at 13.4 million cases. Dessert and fortified wines continued to decline last year, although the sake and imported port and sherry segments each continued on an upward climb. I am glad to see that Japanese sake and Spanish sherry are doing well. Let us hope to see continued gains in the years to come. I am always out seeking out new restaurants to review, whether the restaurants are actually new or just new to me. If you would like your restaurant reviewed, simply email me. My readers can also email me, sending me your suggestions for restaurants that I should review. I do not guarantee that I will review your restaurant if you email me. But I definitely will give it my consideration. I also do not guarantee that you will receive a positive review. I will review it like any restaurant I review, honestly and objectively. Plus, if I choose your restaurant to review, I won't identify myself when I go there. So, I could be any of your patrons, at any time. In addition, if you are running any special events please email me about them. I may post about them on my site. Just send me as much detail as you have about the event. Oriel is an interesting wine company that includes about two dozen famed winemakers from all over the world. Oriel only makes wines in good vintages. Their wines are made in limited quantities, usually a few hundred cases. Oriel acts as vintner, importer and wholesaler, and this enables them to cut costs. I have tasted some Oriel wines before and most of them have been good. The 2003 Oriel Setena Red ($23) is from the Terra Alta region of Spain, which is near the famed Priorat D.O. The word "Setena" is the Catalan word for "one-seventh" which is the amount of the harvest that farmers in ancient Spain once paid landowners for the right to work the land. The winemaker is Xavier Clua who was born into a family with over four generations in winemaking. Cellers Clua currently specializes in producing low-volume, high-quality Grenache blends. Xavier's technique is to interfere as little as possible in the natural winemaking process. "The essence of simplicity is the best way of making wine," he says. The Setena is a blend of 40% Garnacha, 20% Cabernet Sauvignon, 20% Syrah, 10% Tempranillo and 10% Merlot. The wine is aged for eight months in French oak, 70% new. I found this wine to have a bit of a closed nose, except for a very mild smell of almost violets. But, once it crossed my palate, there was an explosion of lush fruit flavors, including blackberry, plum and dark cherry. There is a bit of spice and mild tannins on the finish. It has a medium length finish. The flavors mesh well and it definitely pleases the palate. I very much enjoyed this wine and it is a Drink & Buy. This wine would go well with wild game, or poultry like duck. Yes, I bought this bottle mainly due to the label. It struck me as amusing. Plus, I am willing to take chances on inexpensive Spanish wines, as many of them are decent wines. The 2005 El Burro Kickass Garnacha ($12) is 100% old vines, over 100 years old, Garnacha and aged for four months in American oak. It is produced in the Navarra D.O. and has an alcohol content of 13.5%. This is a juicy wine, with lots of raspberry and dark cherry flavors with a tinge of vanilla. It is a very smooth wine with a moderate finish. It has mild tannins and a nice balance. A great BBQ wine that goes well with burgers and steak tips. This is not just a gimmick wine. It is a tasty, inexpensive wine that should please. Another one of the good value wines from Spain. A definite Drink & Buy. Fantasy football, baseball and other sports are very popular. Fantasy investment games are less popular though they do have their adherents. For those who love wine, a fantasy wine investment game might just be appealing. Decanter magazine, a British wine magazine, runs a Wine Investment game. Though it is not a short game. In fact, you have to wait two years for the results. The results for their 2005 game were recently released. Unfortunately, the deadline for entering their 2007 game is already over. In the 2007 game, you receive 10,000 pounds to purchase a portfolio of wine. There are 25 different wines you can choose. You can purchase as much of any single wine as you want. Then, two years later, in 2009, your portfolio will be examined to see how much its value has risen. The portfolio that is worth the most will be declared the winner. This may be a long time to play such a game, but then wine does not usually appreciate too quickly. It might be more interesting if there was a "draft" and that the wines were limited in number. One key is also finding your authoritative source for determining the price of the wines, when you purchase them and for their final values at the end of the game. For example, Wine Spectator has lists of prices of certain wines, especially those which frequently are involved in auctions. I think alternative versions of this wine investment game could be interesting and fun. Anyone game? On Sunday, September 23, from 11am-4pm, the Phantom Gourmet will host their annual fall Food Festival. Tickets cost $40 which include admission to the street and sampling food from fifty different vendors. Drinks are not included. You can also get into parties inside several clubs. The festival is 21+ (no minors, infants or pets) and will be held rain or shine. The first 800 Phans to enter the event wearing Phantom’s favorite color (purple) will receive a $5 Phantom Gourmet Gift Card. Tickets are limited and not sold at the event. You can order them online or buy them at certain restaurants. Special VIP tickets are available, at $100, which include an early 10:30am entry and entry into Ernie Boch Jr.'s party at Embassy. You can see a list of the participating vendors online. Much of the food is comfort food. From Beard Papa's Cream Puffs to Harrows' Chicken Pies, from Kane's Donuts Coffee Roll to Trani Ice Cream Cupcakes. I have been to this Food Festival before and very much enjoyed myself. There is plenty of delicious food to eat and you certainly won't leave hungry. I think the price is reasonable for everything you can eat. You definitely should try to get there early though as it will get very busy later and then the crowds can be an issue. I will be going to the Festival again this year and look forward to all of different foods. Beverage World reported on a recent study done by Vinexpo, an international wine and spirits exhibition, concerning wine and the "millennials," consumers aged 20-25. The study examined groups in the U.S., France, Japan, Belgium and the United Kingdom. Wine is becoming popular with this group but there are a couple barriers: a perception that wine is expensive and a lack of knowledge and/or confusion about wine. Many are turned off by perceptions of wine snoberry. Many of these consumers also view wine as the drink of choice among older adults, which is not a bad thing. They see wine drinkers as "refined, educated and cultivated." So, how does this affect wine bloggers? Wine bloggers have the opportunity to educate such consumers about wine, to demystify it. Using more everyday language, we can explain about wine and teach them that wine is not some esoteric discipline that takes years to learn. We can also show them that there are inexpensive wines that also taste great. You don't have to spend $100 to get an enjoyable wine. There are plenty of good choices for $10. Also a reminder that there will be a Clambake at Savory Tastes Cafe, cohosted with Harpoon Brewery, on Friday, August 17 and Saturday, August 18, both nights at 7:00pm. Amuse Bouche: Grilled Shrimp with Pico de Gallo. Paired with Harpoon Summer Beer. Price is $65 Per Person, Including Tax & Gratuity. Friends of Harpoon receive a 10% discount. This is an event you will need to reserve early as similar events in the past have sold out quickly. Even though I dislike beer, I am still going, just for the meal. Maybe I will see you there! Just a reminder that there will be a Wine Education class next Saturday, August 18, at 3pm. The topic will be Italian Red Wines. The class will focus on some unique, exceptional red wines from all over Italy. We'll be taking a look at a handful of different regions and showcasing the red wines of that region: i.e. Piedmont, Sicily, Tuscany, the Veneto, Puglia, to name a few. This class is another collaboration with OurGlass Wine Co. Brian, one of the owners, was a personable and interesting speaker and will head this class as well. This is a great opportunity to taste some new and different wines and meet other local wine lovers in the area. The cost is $25 per person, which includes cheese and breads as well as special Tasting discounts. You must call OurGlass to book your reservation. Please do so ASAP as space is very limited. Don't miss it! I visited Sibling Rivalry this evening as part of Restaurant Week. For Restaurant Week, nearly all of the restaurants have special, limited menus available. You often have about three choices for your appetizer and entree. I had previewed the online menu for Sibling Rivalry and they hade four appetizer choices, three entrees and two desserts. The choices intrigued me so I made reservations. I had visited Sibling Rivalry before, for brunch, and had an enjoyable meal. So, I anticipated that dinner would be good as well. I was lucky to get a parking spot close to the restaurant. Though they do have valet service available. Our table was immediately available when we arrived. We received the wine list and the menu and were pleasantly surprised when we were told that the Restaurant Week menu was much larger than what I had previously seen. The entire regular menu, or nearly all of it, was available. There were eleven appetizers and eleven entrees available. Looking at their menu online, there are only a couple items that were not there, including the grilled lobster. There were plenty of interesting options available and it took a little time for me to decide what I wanted to order. With all these choices, this makes Sibling Rivalry a great selection. While waiting for our food, we were given a bread basket with several different choices, including a delicious corn bread and some fruit/grain breads. I ordered a bottle of wine, the 2004 Trinitas Old Vine Cuvee ($40). This was a California wine, a blend of several varietals, especially Zinfandel, Mataro and Carignane. This was an excellent and flavorful wine with good dark berry flavors as well as a nice spicy finish. Very good choice. One of our appetizers was the Warm Fig Salad with Pancetta, Grilled Flat Bread, Roquefort Cream and Port Wine Vinaigrette. Presentation was very nice, and everything tasted very good. Our other appetizer was the Pristine Tuna Tartar Served on Warm Sushi Rice, With Sticky Soy Glaze, Pickled Ginger and Spicy Aioli. This was a superb dish with plenty of small cubes of tender tuna. The different sauces were a nice accompaniement. I would definitely order this appetizer again. Again, the presentation was very nice. Our first entree a Tender Filet of Beef with Tomato Jam, Creamed Onions, and Black Pepper Gnocchi. A wonderful piece of very tender beef, cooked perfectly rare. The gnochhi were also very interesting and delicious, making us desire more of them. The second entree was the Crispy Pressed Half Duck with Grilled Bacon Wrapped Stuffed Medjool Dates, Port Sauce and Watercress Salad. A small part of the duck skin had been a bit overcooked and blackened. Our waitress was quick to offer me a new duck if I wanted but I chose to keep what I had. I did not want to wait for a replacement and it was only a minor issue. But, they earn points for offering to remedy the situation. The duck was a half duck but it certainly was a large half. It had plenty of meat and some nice crispy skin. The meat was tender and juicy, and not greasy at all. And there was almost no fat. The sauce was superb. I very much enjoyed the duck and would order it again. For dessert, we had three choices though you could also get a cheese plate for an additional cost. We had the Chocolate Mousse Cake with Vanilla Creme Anglaise, Raspberry Coulis and White Chocolate Mousse. A delicious and decadent dessert. We also had a Wild Berry dessert with an Oatmeal drizzle and Vanilla ice cream. This was also a very good dessert with lots of sweet berries. Service was excellent, attentive without being overbearing. Overall, this was an excellent dining experience. Especially for Restaurant Week. I would heartily recommend Sibling Rivalry at any time, not just during Restaurant Week. I will definitely return there.